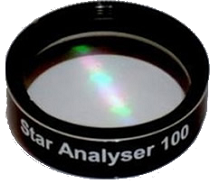 The Star Analyser 100 is a high efficiency 100 lines/mm transmission diffraction grating, blazed in the first order. 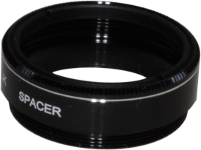 It is mounted in a standard 1.25 inch diameter threaded cell, to be compatible with most telescopes and accessories. 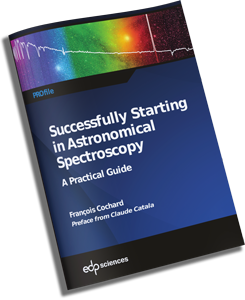 It has been designed to make the production of low resolution spectrum images of a wide range of point like astronomical objects as easy as possible. 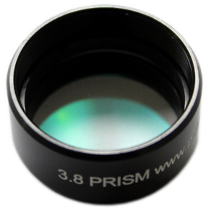 It complements a wide range of types of camera used in astro-imaging. It can however also be adapted for visual use. If you intend to use a Star Analyser in a filter wheel, we recommend you to use a Star Analyser 200.